A 1964 painting by late artist Kim Whan-ki sold for HK$28 million (4 billion won) in an auction in Hong Kong over the weekend, Seoul Auction said Monday. The oil painting titled "Morning Star," 145.5 by 145.2 centimeters in size, started at around 2.8 billion won, but bids escalated to finally fetch 4 billion won at the auction held at the Grand Hyatt Hotel in Hong Kong on Sunday. The abstract art master holds the record for the most expensive Korean art ever sold at an auction. In April, "Tranquility 5-IV-73 #310" fetched 6.55 billion won during an event by K Auction, shattering his own previous record. Kim has arguably been the most sought-after artist in Korea, as four of his artworks were among the 10 most expensive paintings sold in auctions in the first half of this year, according to the Korean Art Appraisal Association. A native of the small fishing town of Shinan, southwestern Korea, Kim (1913-1974) was one of the country's pioneers of abstract art. In early 1960s, he moved to New York and stayed there until his death in 1974. 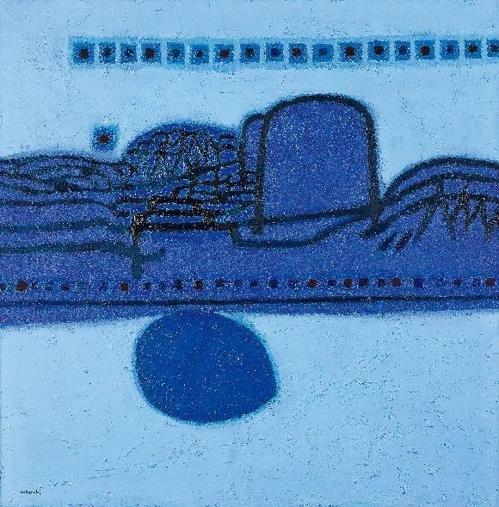 Seoul Auction said "Morning Star" demonstrates his style transition from representation to abstraction.